Special Containment Procedures: The SCP-2688-A population is aware of SCP-2688's anomalous nature, and have agreed to provide information regarding the history and anomalous properties of the region in exchange for being allowed to continue living within it. No information regarding the Foundation, ORIA or any other Group of Interest is to be released to SCP-2688-A instances, unless as part of an Exchange of Information Agreement authorized by the current Director of Area 58. Area 58 has been established on Bubiyan Island near SCP-2688, with additional facilities located on other areas of the island, disguised as a Kuwaiti military base. Description: SCP-2688 is a small farming village located on Bubiyan Island, Kuwait, containing a population of 135 people. SCP-2688's current population (hereafter referred to collectively as SCP-2688-A) are culturally and linguistically distinct from other Kuwaiti groups, speaking a creole with loanwords derived from Koine Greek, Babylonian Akkadian, Imperial Aramaic and Mesopotamian Arabic. SCP-2688-A practice a religion loosely resembling Iron Age Akkadian belief systems, centered on the deity Nammu. SCP-2688-A voluntarily remains isolated from the outside world, though passive observation of other groups was common prior to the ORIA establishing control over the region. All children conceived within SCP-2688 will display multiple physical malformations of a highly random nature. These malformations include, but are not limited to, extra or missing sensory organs, benign tumours and teratomas, and malformed or missing internal organs. It is currently unclear whether this anomaly only affects SCP-2688-A or extends to any children conceived within the village, as testing it has been deemed unethical. Any liquid water not within a biological organism brought within an approximate two kilometer radius of the temple complex will spontaneously transmute into a solution of amniotic fluid, cerebrospinal fluid, gastric acid and sodium chloride suspended in water. The concentration of this solution will vary. SCP-2688-A instances experience none of the unhealthy effects that would normally occur from coming into contact with this solution, and utilize it in the place of water. This solution has religious significance to SCP-2688-A, and it is often used in libation and purification rituals. 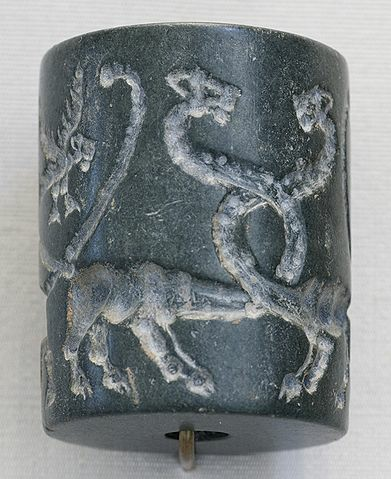 A cylinder seal created by the ancestors of SCP-2688-A. Dates to approximately 200 BCE. 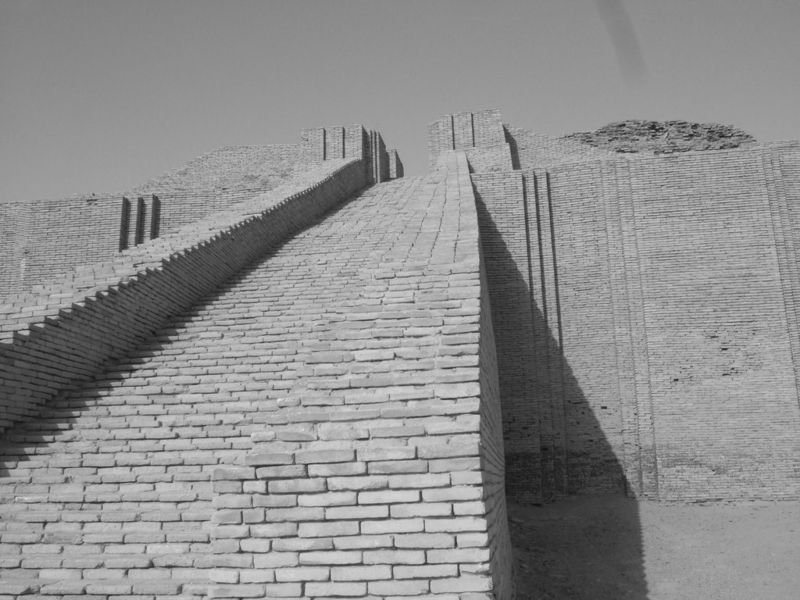 In the center of SCP-2688 is a large ruined ziggurat, dated to approximately 4100 BCE1. Though not itself anomalous, the ziggurat is anachronistic, as it is over a millennium older than any other structure in the area constructed using similar methods. Several anachronistic or formerly anomalous artifacts have been recovered from within the ziggurat, including cuneiform tablets in an unknown language, dated to approximately 4000 BCE2, and seven mummified human cadavers displaying similar anomalies to those experienced by SCP-2688-A, dated to between 200 BCE and 900 CE. A subterranean system of tunnels, constructed at approximately the same time as the temple complex, extends more than 500 metres beneath SCP-2688. These tunnels have not been mapped in their entirety. The only entrance to these tunnels is from the ziggurat in the center of the village. The use of ground-penetrating radar has shown that at the base of these tunnels is an unusually large, anomalously stable underground body of water at least 90 km2 in size. Based on texts uncovered from the site, it is believed that SCP-2688 was continuously inhabited from approximately 4100 BCE to 1200 BCE, at which point it was abandoned due to invasion from the north by an unknown group. In approximately 300 BCE, the site was resettled by a group of Hellenes and Babylonians. SCP-2688-A is descended from these settlers. With poison, instead of blood, she filled their bodies. With splendor she decked them, she made them of lofty stature. Their bodies reared up and none could withstand their attack. They bore cruel weapons, without fear of the fight. Her commands were mighty, none could resist them. If the infant has two ears on the right and none on the left - Nammu is in peace. If the infant has two ears on the left and none on the right - Nammu is discontented. If the infant has two heads - There will be a fierce attack against the [House/Temple] of Nammu. If the infant is a lion with two heads - There will be discontent in the [House/Temple] of Nammu. If the infant has no eyes - Nammu will make the land waste. If the infant has two eyes on the right and none on the left - Nammu will birth children and the land will live in peace. If the teeth of the infant protrude from its forehead - Dire need will seize the land. If the ears of the infant are on their sides and its head is solid and it has no mouth - Nammu will speak humbly to the [ruler/lord] of the Cosmic Waters. If the abdomen of the infant is open, and it has no intestines - There will be famine. If the neck of the infant turns towards its belly and it holds its intestines in its mouth - The land will prosper. Is this not the composition of the waters? There was a time in which there existed nothing but darkness and an abyss of waters, imprisoned therein were the most hideous beings, which were produced of a two-fold principle. There appeared men, some of whom were furnished with two wings, others with four, and with two faces. They had one body but two heads: the one that of a man, the other of a woman: and likewise several organs both male and female. Other human figures were to be seen with the legs and horns of goats: some had horses' feet: while others united the hind quarters of a horse with the body of a man, resembling in shape the hippocentaurs. Bulls likewise were bred there with the heads of men; and dogs with no eyes: horses also with the heads of dogs: men too and other animals, with the heads and bodies of horses and the tails of fishes. In short, there were creatures in which were combined the limbs of every species of animals. In addition to these, fishes, reptiles, serpents, with other monstrous animals, which assumed each other's shape and countenance. The person who confined them was a woman named Nammu; which in the Chaldean language is Thalatth; in Greek Thalassa, the sea. All things being in this situation, the Archon of the Cosmic Waters came, and cut the woman asunder: and one half of her he placed in the earth, and the other half in the heavens; and at the same time begat the animals within her. A reproduction of the cylinder seal impression found at the bottom of the tablet. To Daughter Ninshubur of the Keepers of the Mind, Servant of Mikannu4, say: thus speaks Father Ziusudra, [Priest/Lord] of the [House/Temple] of Nammu, Servant of Mikannu. Your Father bears ill news of home: The door is broken, the lock is wrenched. The dead have been brought up, and the dead outnumber the living. The King of Lachish sets aflame his own people, but he will not stem the Red Tide. The King of Ugarit abandons his country to itself, but he will not be spared. The sky beyond Eridu's Star lies open, the Cosmic Waters pour forth. The Sorcerer King rises from a rotting [world/"foreign land"/afterlife], the Lord of the Cosmic Waters follows his command. Our brothers and sisters in Kaptaru5 march to the end of all things, but they may not return. The lord of the Cosmic Waters seeks the [House/Temple] of Nammu, your Father knows not why. If the [House/Temple] of Nammu is taken, the blood of Mikannu will be lost, and the blood of Mikannu must not be lost. Whatever occurs, we must defend what remains of the light. In 1955, the Office for the Reclamation of Islamic Artifacts became aware of the existence of SCP-2688 and attempted to establish a presence within it, an action which SCP-2688-A responded to violently. This conflict lasted for thirteen hours, after which the ORIA were able to forcibly take control of the region. In 1991 Foundation operatives conducted a raid on SCP-2688 and were able to capture it from the ORIA. Individuals with Level 4 or higher security clearance may access Document-2688-Aleph for details on the operation. Foreword: SCP-2688-A5 is a 73 year-old male, possessing a small orbital tumour in the place of its left eye, and an abnormally enlarged right orbit accommodating an additional non-functional vestigial eye located approximately two centimeters above its right eye. SCP-2688-A5 acts as both a religious and secular authority within SCP-2688-A, having being chosen by the previous "Belos" to act as its successor. Additionally, SCP-2688-A5 is one of the only ten literate SCP-2688-A instances. Interview was conducted in the creole spoken by SCP-2688-A. Dr. Ahmadi: Good morning, Belos. I would like to ask you a few questions about the history of your village. Let's start with the obvious. Why did your people migrate here? SCP-2688-A5: My people were led here long ago. We were gathered in the north and sent to find the land of Dilmun. Dr. Ahmadi: Could you clarify further? Dr. Admadi: Speak up, please. SCP-2688-A5: You will not understand. SCP-2688-A5: [visibly agitated] There is no need to call upon the ignorant. I will attempt to enlighten you, though you will not understand. Dr. Ahmadi: Alright then. Continue. SCP-2688-A: My ancestors, the initiates of the Ionic Mysteries, were gathered by Karcist Tulva, vizier of Tursaat of the Cosmic Waters. They were sent to settle the once-prosperous land of Dilmun, in the name of our immortal father. When they arrived at this place, my ancestors rejoiced, for a reward had been prepared for them. SCP-2688-A5: This village lies upon a diseased god. A rotten creature, whose fevered mumblings shape our flesh. It was a gift beyond measure. We may be as flies to the gods, but flies make feasts of the sick and dying. 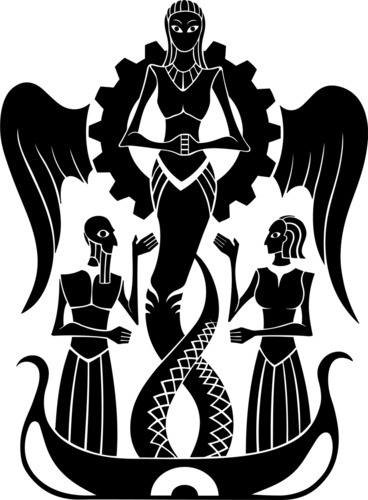 SCP-2688-A5: Nammu, Thalatth, Tiamat. She goes by many names. She whispers into the wombs of our people and moulds the flesh within, telling us her secrets and her desires. We will feast on her rotting form, and in return we will birth her children into the world, exalt her and raise her into power. Dr. Ahmadi: And what will happen then? SCP-2688-A5: I… I do not know. But I am certain that my people will be as gods. Do you have any more questions, or may I go? Dr. Ahmadi: Just a little longer. My organization wants to explore the caves beneath your temple. We just wanted to make sure that is acceptable to you first. May we enter? SCP-2688-A5: We do not descend into the caves below. The old texts spoke in vague terms of a great temple in the center of our village, but not until the Persians dug it up did we know it existed. It belongs to Nammu, not us. If you wish to enter, we will not stop you, though she may. Closing Statement: As permission to enter the cave system beneath the ziggurat has been granted, exploratory efforts are to be undertaken as soon as preparations are complete. As SCP-2688 has been confirmed by SCP-2688-A5 to be Sarkic in origin, Foundation and GOC representatives of Project: Sitra Achra will oversee future containment and research of SCP-2688. Dr. Ahmadi (Area 58 anthropologist and assyriologist), Dr. Singh (Area 58 biologist), Agent Al-Bayati (Member of MTF Zeta-9 "Mole Rats") and Dr. Morrison (GOC Special Observer archeologist) enter the temple complex at the center of SCP-2688. Agent Al-Bayati is equipped with a SIG Sauer P226 sidearm at the suggestion of Dr. Morrison. The walls and ceiling of the cave are completely coated with a lining of thin muscular hydrostats between fifteen and sixty cm in length, which dangle loosely. These organisms have been collectively designated SCP-2688-B. After approximately three hours of uneventful exploration of the cave system, the expedition team discovers and enters a cylindrical chamber approximately 30m in diameter and 5m tall, constructed out of fired brick, through one of six arches spaced equidistant from each other. The walls of the chamber display bas reliefs depicting mythological scenes, the majority of which are rendered incomprehensible by significant damage from SCP-2688-B. One relief remains mostly intact, depicting a large female figure and six male figures. Four of the male figures are depicted holding, respectively, a bundle of grain, a clay tablet and stylus, a shield studded with bronze disks and a spear, and a crown. The remaining two male figures have been almost entirely destroyed by SCP-2688-B, but presumably at some point held an additional two objects. The female figure is depicted holding in one hand the "winged gear" motif also found in the cylinder seal impression of the Sumerian tablet recovered from Sahiwal. The floor of the chamber is covered by a uniform layer of iron oxide flakes approximately 2cm thick. may she lead me to correct the mistakes in my practice tablets. On the opposite side of the tablet the prayer is repeated in different handwriting, with the addition of several grammatical, calligraphical and spelling errors. At this time audio contact is lost with the expedition team, and camera feeds becomes heavily corrupted. Recovered frames depict unidentified green limbless entities with human facial features. Other recovered frames depict a black viscous substance dripping onto the arm of Dr. Singh, causing rapid anaphylaxis and the development of several tumorous growths. At this time the helmet cameras of all four personnel cease transmitting entirely. All members of the expedition are considered KIA. Approximately twelve hours after loss of contact, Agent Al-Bayati's helmet camera begins functioning again, and though Site Command is unable to send messages to her, audio from her radio is received. Agent Al-Bayati is within a large, cavernous space of indeterminate size, the majority of which is taken up by a large body of water. Ripples and waves are visible, despite an apparent lack of wind. 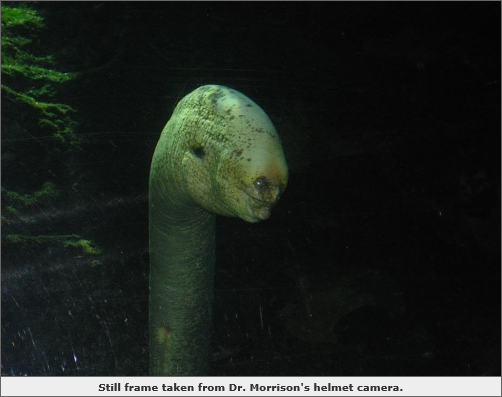 The colouration of the water indicates that it is affected by SCP-2688's secondary, transmutative anomalous property. Despite being underground, the horizon is visible in the distance. The sound of waves and what is believed to be Agent Al-Bayati's breathing can be heard, interrupted intermittently by the sound of organic material scraping on stone in the distance. Abruptly, the sound of metal scraping causes Agent Al-Bayati to turn her head away from the water's edge. A humanoid, resembling a Middle-Eastern bearded male with crude bronze prosthetic modifications to the arms and eyes, becomes visible. Fleshy tendrils travel from the floor to within the cybernetics, and its facial features are heavily distorted by the growth of several large chloromas. The humanoid appears unconscious, but is breathing and blinking rapidly. Agent Al-Bayati begins slowly walking towards the humanoid while it sits up and outstretches its right arm as far as its tendrils will allow. Agent Al-Bayati kneels down and allows the humanoid to touch its thumb to her head. At this time, Agent Al-Bayati begins speaking in Babylonian Akkadian. She will die. It is not my fault. Yes it is. My hand was forced. I am sorry. Nammu lead you here because she wants to kill you and because she wants you to live. I was not always as I am. Once I was Ziusudra. That has ended and now the Blood is sick. No. I am sick. No. She is sick. Yes. We are all sick. I am confused. Who are you? Nammu now begins to roar and smite, and her deeds are evil. Our minds are hollowed out and we can feel it. My people, the priests of this temple, are gone. They fled or joined when the Red Tide came. The gods are dead or mad. Ereshkigal claws at shadows. Ninkasi hides from the world. Enki is fragmented. The Lamassu have no masters. Ziusudra cannot think and cannot live and cannot rest. But you can slow the flood. Yes. Karcist Tulva sees you. The fish-men are his eyes. I am his eyes. He will sacrifice the city above to awaken Nammu. You must hurry and prepare for the mingling of the waters. I am sorry. He sees you now. The ones above too. Go. At this time Agent Al-Bayati's helmet camera and radio cease functionality. No further contact with the unidentified humanoid has been recorded. Further exploration of SCP-2688 has been postponed indefinitely. All members of the expedition team are once again considered KIA. 1. Thermoluminescence dating is used to date most SCP-2688 artifacts. 2. All other cuneiform tablets date to the late 4th millennium BCE at their oldest. 4. It is believed that these five signs (DMI.KA.AN.NU) are meant to be interpreted phonetically. It is possible they represent a transliteration of a proper noun from another language. 5. This word refers to Crete, but in this context it may represent the Aegean as a whole.